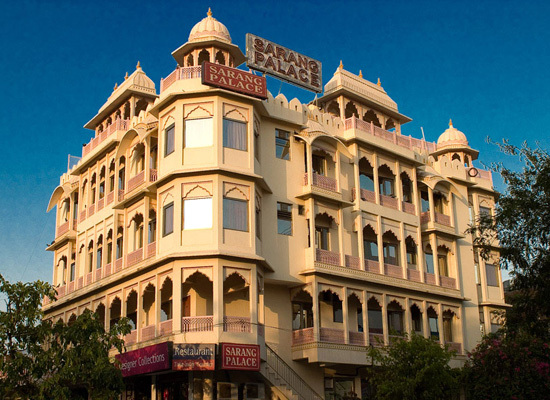 "Hotel Sarang Palace has been voted as the best run independent hotel in the city of Jaipur. 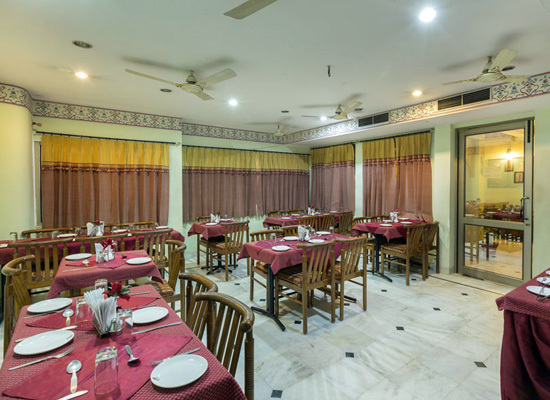 When talking about most comfortable 3-star budget hotels in the city, Sarang Palace probably lies on top of the list. 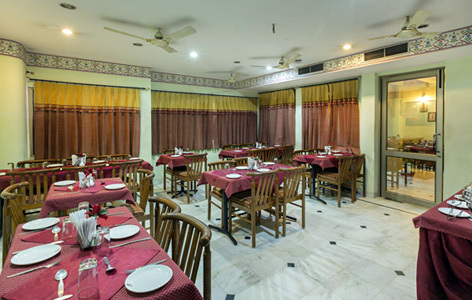 The hotel is ideal accommodation as it is located near the airport and railways stations and also many tourist attractions like, Jal Mahal Jantar Mantar and Birla Mandir are very close to the hotel. 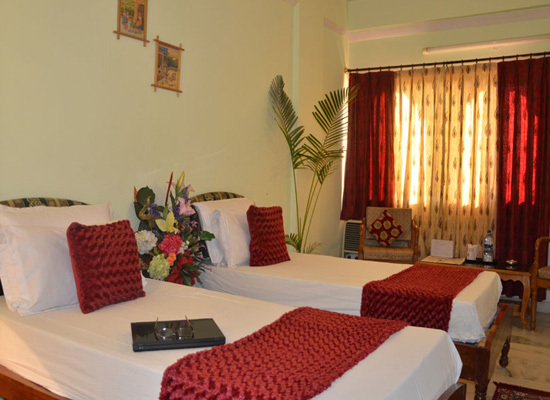 The hotel serves each and everyone with warm hospitality and wide range of amenities. Quite spacious, air-conditioned deluxe rooms come with interiors that are a mix of modern and traditional designs. You have an option of twin/king-size bed. Some of the other comforts of these well-lit and well-ventilated rooms include TV with cable connection, quality linen and curtains, work desk, luggage rack, reading lamps, wooden wardrobe with hangers, round the clock room service, full-size mirror, direct dial telephone, center table with chair, and attached bathrooms with complimentary toiletries. The air-conditioned superior deluxe rooms are quite spacious and are perfect for families as they also have an option of double bed or twin beds. The décor is traditional Rajasthani. Savor the views of the surroundings from the attached balcony. Direct dial telephone, reading lamps, European-style bathrooms with toiletries, TV with cable connection, study desk, center table with comfortable chair, round the clock room service, luggage rack, wooden wardrobe with hangers, full-size mirror etc., make your stay comfortable. The mini suite of the hotel, Executive rooms are quite large and come with rich curtains and linens. Miniature paintings on the ceiling is the best part of the Rajasthan-inspired décor. The attached balcony offers the views of the city and lets ample air and light to come in. These air-conditioned rooms also features a large, separate lounge area with a sofa set. Enjoy facilities and amenities such as work desk, reading lamps, huge European-style bathroom, premium toiletries, twin beds/king-size bed, direct dial telephone, LCD TV, round the clock room service, full-size mirror, center table with chair, wooden wardrobe and so on. 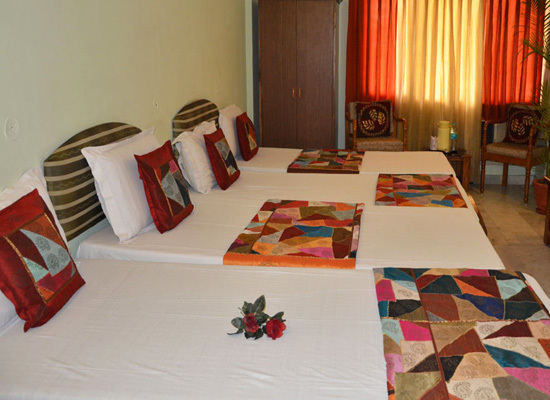 The huge and air-conditioned four-bedded rooms come with 4 separate beds and are ideal for group of close friends of a family. The traditional Rajasthani décor looks wonderful. The balcony not only offers wonderful views but also let sunlight and air come-in. Have a memorable stay with conveniences like reading lamp, work desk, Cable television, European- style bathroom with toiletries, rich linen and curtains, 24X7 room service, direct dial telephone, full -size mirror, luggage rack, wooden wardrobe, comfortable chair and center table. Placed on the top floor in the hotel, these rooms have ample space with terrace that offer views of Nahargarh fort and Aravallis. Interconnecting rooms are also offered. Traditional Chattris have been made where you can sit and relax. 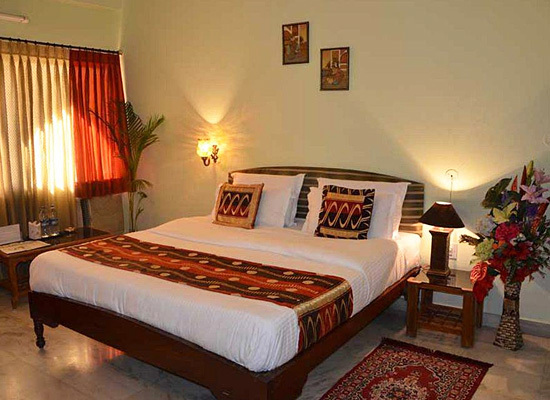 These air-conditioned, huge rooms have Rajasthani interiors with beautiful frescoes on the ceilings. Guests of these rooms enjoy traditional welcome, complimentary breakfast, free transfers, complimentary Wi-fi facility, and services of the travel desk, etc. 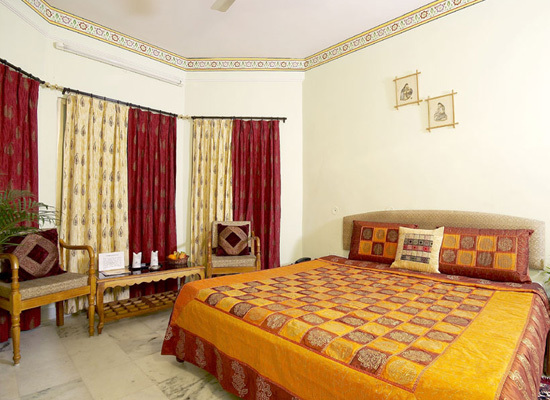 The list of amenities and facilities in these rooms are quite long and consists of option of twin bed or double bed, mini-bar, attached bathroom with premium toiletries, work desk, telephone, LCD TV with sable connection, center table with seating, round the clock room service, full-size mirror, direct dial telephone, wooden wardrobe, reading lamps and more. Overlooking the lofty Aravallis and the mighty Nahargarh fort, the hill-view rooms are air-conditioned, well-lit and well-ventilated and offer an option between twin-beds or a king-size bed. 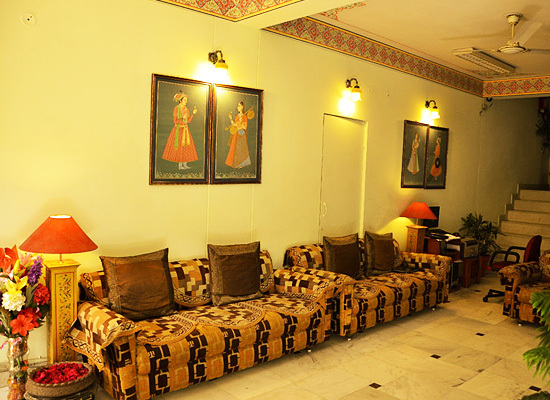 The décor is classic Rajasthani style. Some of the special highlights include sightseeing planning by travel desk, traditional welcome, free breakfast, welcome drink, free transfers, complimentary wireless internet and newspaper. World-class contemporary comforts like direct dial telephone, reading lamp, work table. 24-hr room service, LCD TV with cable connection, European-style bathroom with all toiletries, wooden wardrobe with hangers, center table with chairs, full-size mirrors, luggage rack etc., make your stay comfortable. 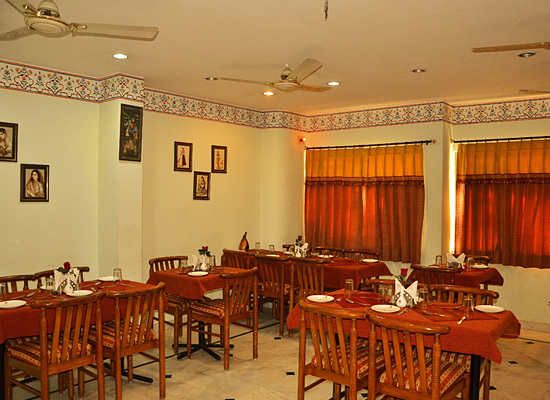 Pakwaan: Multi-cuisine restaurant specializes in Rajasthani, Mughlai, Indian and Continental dishes. 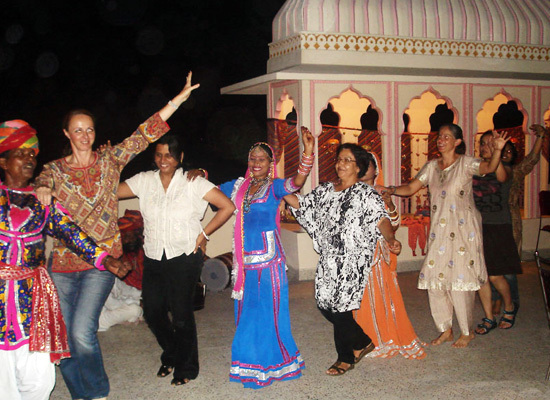 For entertainment while dining, folk dance and music performances are arranged. Angithi: This restaurant located on the Roof Top offers delicious aromatic coffees and Snacks along with glorious views of Aravalli hills. Darbar: The multi-cuisine restaurant specializes in Indian and International cuisines bringing out the true flavors of the city. The Pink City of India, Jaipur, is encompassed by magnificent Aravali Mountains and serene lakes on every corner. On every corner of the city, one could check out vibrant stalls, picturesque gardens, tranquil lakes, glorious palaces and religious temples. The major tourist attractions in Jaipur include the Albert Hall Museum, the City Palace, the Jantar Mantar, the Amber Fort, the Jai Mahal, the Rambagh Palace, Hawa Mahal, etc.